There has been a church on this spot since about 1525, but it was destroyed and rebuilt several times in the following centuries as the city of Granada was attacked by pirates and others. Construction on the current version began in 1888 but was not fully completed until 1972. 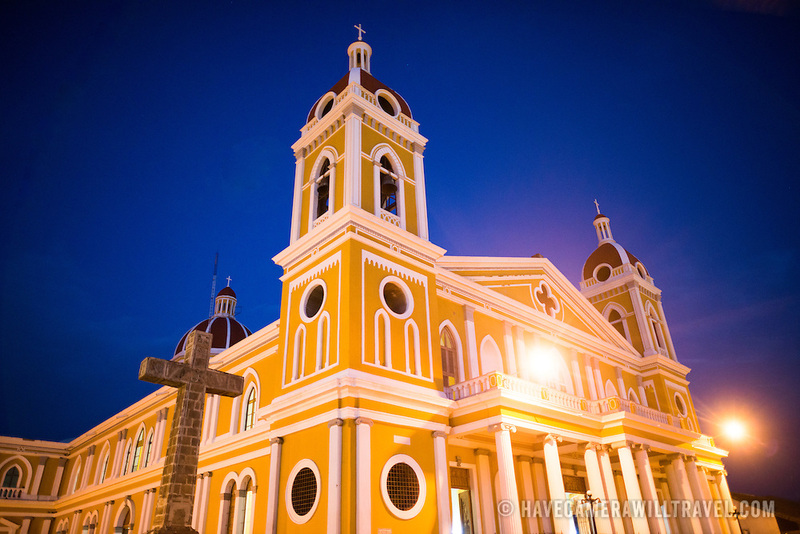 With its distinctive yellow with white trim exterior, it stands over Parque Central in the heart of Granada, Nicaragua. The cross was installed in 1901 and is made of basalt. At the top the inscription INRI is read, and a chalice and a bunch of grapes symbolizing the blood of Christ . In the center, where the arms are crossed, the X and P interlaced letters: monogrammed initials Redeemer. On the left arm, there are four quadrangles, with a cross in the center of each- symbolizing the four Gospels . On the right arm, two arms entwined, symbol of the union of Christ with humanity. At the foot of the cross, there is a skull on two femurs crossed to represent the bones of Adam , finally-in the base-, bears the inscription "Jesus Christ God, man lives, reigns and rules".